Food manufacturers are in business to make money and they know just how to do it. The whole idea is to sell us something that's readymade to make our lives easier and meal preparation as simple as possible. And that's a good thing. Who wants to come home after a long day at work and build every little detail of a recipe from scratch? But most of us don't want to part with our hard-earned dollars for something we don't really need, either. 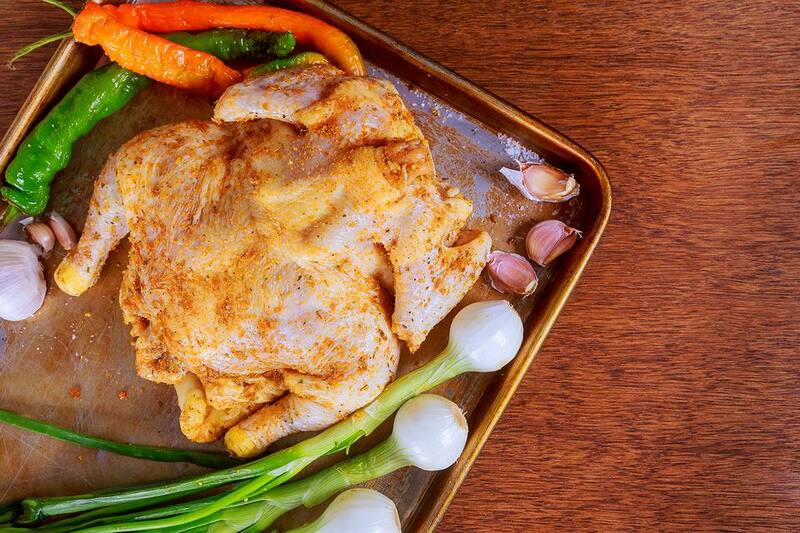 You can make your own poultry seasoning in minutes. Do it on a weekend and tuck it aside until the next time you need it. Poultry seasoning is nothing more than a blend of several common herbs that you probably already have in your pantry or grow in your garden. You'll save money mixing them together yourself, and—better yet—you can customize the recipe to your family's tastes. Go take a peek at your spice rack or that corner of your cabinet where you keep all your spices and herbs. Do you see some dried marjoram in there? Savory, parsley, sage, rosemary, and thyme? How about onion powder? If your answer is yes to all of the above, you're all set. If you said no once or twice, it's no big deal. Even if you have to hit the market to purchase one or more of these dried herbs, you're still going to come out ahead financially because you'll use them for numerous recipes going forward, not just for your poultry seasoning. Use two parts each of the marjoram, savory, and parsley to one part sage. The thyme can be a matter of personal taste, but somewhere between one and two parts is good. Go light on the rosemary and onion powder because they can be a bit overpowering—unless, of course, your family really likes them. Place all those spices in a bowl and blend them together. You don't have to overdo it. Just stir long enough that the mixture appears to be all the same color and texture. You can grind the poultry seasoning with a mortar and pestle if you prefer a more powdery consistency, or pulse it briefly in a food processor. You can also use a coffee grinder or a spice grinder. Store your poultry seasoning in an airtight container such as a glass jar, a spice bottle, or a sealable plastic bag. It should easily keep for up to three years, but this is based on the age of the oldest spice you used in the mixture. If the rosemary was already sitting in your cupboard for 30 months, the timeframe will be shorter. And, of course, it's always best to use herbs sooner rather than later. You'll also want to keep the seasoning in a dry, dark, cool place to prolong its shelf life. Be sure to label it so you don't accidentally mistake it for something else. This is a pretty basic poultry seasoning recipe. If you don't have all the herbs mentioned above, feel free to use just the ones that you do have if you don't want to go out and buy more. It'll still add plenty of flavor to your turkey, stuffing, soup, or whatever dish you're adding it to. Poultry seasoning is very forgiving. You can also leave out any herbs that you don't like or increase or decrease the amounts called for so that the recipe better suits your tastes. There are also plenty of herbs and spices you can add to make the recipe your own, such as celery seed, nutmeg, ginger, cayenne, paprika, coriander, basil, black pepper, garlic powder, garlic salt, or celery salt. If you have a favorite brand of poultry seasoning that you're used to buying, look at the label to see what herbs and spices it includes, then create your own version. If you want to use herbs from your garden, be sure to dry them first. This can be accomplished by hanging them upside down in a warm, dry spot, running them through a dehydrator, or drying them in an oven set at its lowest temperature. If you decide to go with the oven, watch the herbs closely so they don't burn. It doesn't take very long to dry them because they tend to be so thin.